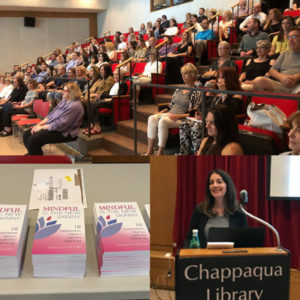 I am still on such a high from my book talk and signing at The Chappaqua Library, where I discussed my newly released book, Mindful is the New Skinny: 10 Transformational Steps to a Lighter You Inside & Out. I spoke about how difficult the process of writing and publishing a book was for me; how I expected things to be easy and smooth, but when it didn’t go as planned I basically became BOOKZILLA. I was becoming a judgmental perfectionist who constantly beat myself up and those around me; which is ironically the exact opposite of what my book was preaching. This literally smacked me in the face when I realized how out of alignment I was with my own brand of reducing stress and anxiety! Writing this book taught me so many lessons that I couldn’t have imagined. It was a release and a joy to share my journey of discovery with my audience. As the saying goes, we teach what we need to learn. For the few days before the talk, my stomach was in knots like a bunch of tangled up headphone cords. Sure, I was used to speaking in public by this point but when speaking before a crowd that may or may not be skeptical about meditation and mindfulness, that are your friends and family, that know you in a different capacity, it can be intimidating. I followed my own advice and tried to not push the fear away but just tolerate the feeling. I tried to put it in a box and focus on the present and whatever I was doing in the moment. This was not easy, as it slipped back into my head from time to time. However, when I got up to speak I wasn’t nervous at all. Somehow, it was just natural. The audience at the Chappaqua library was so welcoming as I told my story that I was overwhelmed with emotion and gratitude for all who attended. As I shared the process of writing this book, I also shared the inspiration for the book. My journey to mindfulness really started when I was diagnosed with Celiac Disease in 2003. From being ‘Junk Food Jodi’ who lived on chips and soda, I suddenly had to give up gluten and be mindful of everything I ate! Although it was devastating at the time, I learned not only about how food affects the body, but so much more. I discovered spirituality and began my education in mindfulness, meditation and holistic practices. As I finished my talk, I took a moment to look at all the faces in front of me. It was over a hundred eyes looking and listening to my story. What moved me is that they truly seemed engaged; they were tuned in and this unique journey of writing and publishing a book took on a new dynamic: a mutual understanding. These people at the talk, some I knew and some I didn’t, found moments in my words that rang true for them. I cannot tell you how powerful a feeling that is but it made all the Bookzilla moments worthwhile. One woman, who I never met, told me how a group of women on a retreat she went to, all bought the book. They were quoting me and using Mindful Is the New Skinny as a resource for their self-improvement. I was really touched by this and amazed that my book was really out there and helping others! I am so grateful for all the support of my friends, family, clients and community. I am truly blessed. I especially don’t know what I would have done without my mother who cheered me on and was by my side the whole time, and flew up to be there. I will say that I’m glad this event has passed and the pressure is now off. I do know that there will be more ways that I will be pushed out of my comfort zone as time goes on. As nerve wracking as it may be, I do know that the gratification that comes when it’s finished makes it all worth it. This is not about me and whether people like me or not, it’s about the message that I have to share that has the potential to change lives. I am sad that I was away and missed the reading but you are amazing and wise and so very thoughtful! Congratulations on this accomplishment! Amazing Jod. I am so happy for you and all of your success!You are truly an inspiration!!! Jodi – I am so amazed by you. You are truly so special in so many ways. I am so upset I was dropping off my younger at jfk during your talk but sounds like a wow. You deserve all the accolades! Bravo! !